Ok folks this is the official flouro grow challenge... This is for fun and intended ribbing of other forum members in this grow, as well as to see what we can do with just flouro's in 60 days... this should also help others who intend to start early this year. The prize is bragging rights that is all. Everyone listed please Im Onefoul1 for the seed. He is the only player knowing what were going to grow, don't ask cuz he won't tell... hell I don't even know. 1. Floro only... any kind or size is ok.
2. Starts on Nov 6th and goes to January 5th. 4. Any nutrients or additives. 5. Pics of your setup before ya start with a description, so others can see what your working with. 6. Every 5 days requires a pic of progress, with something for scale in the pic, we'll start with a quarter. 7. 10 seeds to germinate 4 to grow to a finish... at the end of the grow the forum will vote on who won. (This isn't a PC grow, not a damn thin for 2n'd place, ya lost.) It's only for bragging rights only. 8. Everyone have fun and learn something along the way. Ok that's about it, it's up to you to decide what ya want to try and do ... height, bushiest, and ya would probably be a winner if ya can get a pod, even not ripe. I hope in some way, this thread can help new as well as seasoned growers alike. This contest is not about growing the world's next new hottest pepper, or even trying to get one to fruit. It's about getting a jump on the season. Edited by S.S.Tupperware, 24 October 2011 - 06:52 PM. 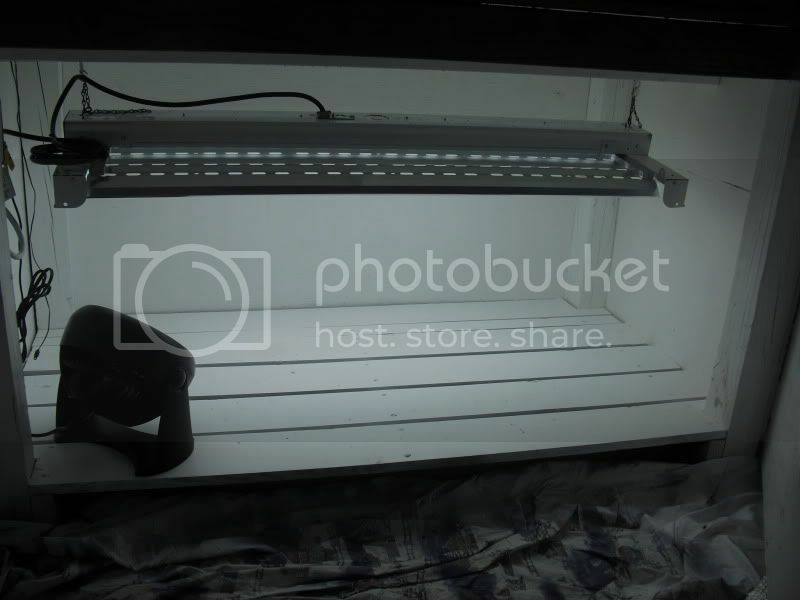 This is the enclosed bottom of my potting bench, a 6 bulb T-8 4 warm 2 daylight. And the other is one I pieced from left over stuff around the house, except for the bulbs, and a timer I'm going to get at Wally World today. I still need to get a couple comp fans for ventilation, I already have a thermostat to switch the outlet fan on when needed, and one lower is on when ever the light is on. it's tight and insulated, so it get too hot quickly. on a side note, might make a good dryer with an incandescent in there for more heat with a fan. Is it too late for me to join the flouro challenge? I decided to go ahead and make another grow box for this competition. Let me know if I can still join in. Thanks! Sounds cool guys. While I think 60 days is a little fast, this should still be interesting to see where most growers are at that time. I'm in. So seeds get wet on Nov 6th right? Hope we all get em by then. OneFoul I am pming you now. The final result is fully adjustable frame (for versatility) with a Tek HO T5 light consisting of four 4ft bulbs (2x 6500K, 2x 3000K). I may add some kind of frame for a reflective tent down the road, but this should be a good start. Let the challenge begin! *I apologize for the cell phone pics, will do better next time! Edited by IndyHot, 23 October 2011 - 09:25 AM. Get ya made it in, I said morn, but it's closed now. We should have seed to start Nov.6, If ya want after 60 days, those who want to keep going we can go as long as you like, just remember bragging rights is for 60 days, or I guess those can join in round 2 trying to get a pod. Good luck all. Awesome thanks! Pm'ed Onefoul1 already. Any specific categories that we could win in or are they not chosen yet? No real specific category, 60 days should make for some nice starts to be planted out, this isn't a grow to the end, well for some it may be... DOH!!! As far a prizes ya get a forum ATTA BOY... Everyone chime in when ya get your seeds. Wow I can hardly wait to see this unfold. Very nice, similar to what I have drawn up and developed my material list. I planned on adding 2 longitudinal pieces (front and back)at the base, where you have caps for additional longitudinal stability, and was only going 5'L x 5'H rather than adjustable height. I also planned for 2-2' fixtures to allow for differential growth, rather than one 4' fixture. How are you finding stability? Are your mains 1"pvc or larger? Thanks. Sorry if this is a highjack I will delete. I would go with the 4 footer, and adjust the plant height, 2 fixtures and your missing light in the middle, plus plants don't grow the same height... Ya raise the lamp for 1 and the rest start to stretch. My.02 Please use some sort of reflector, or your wasting light and time. Just think every bit of light (Fl. 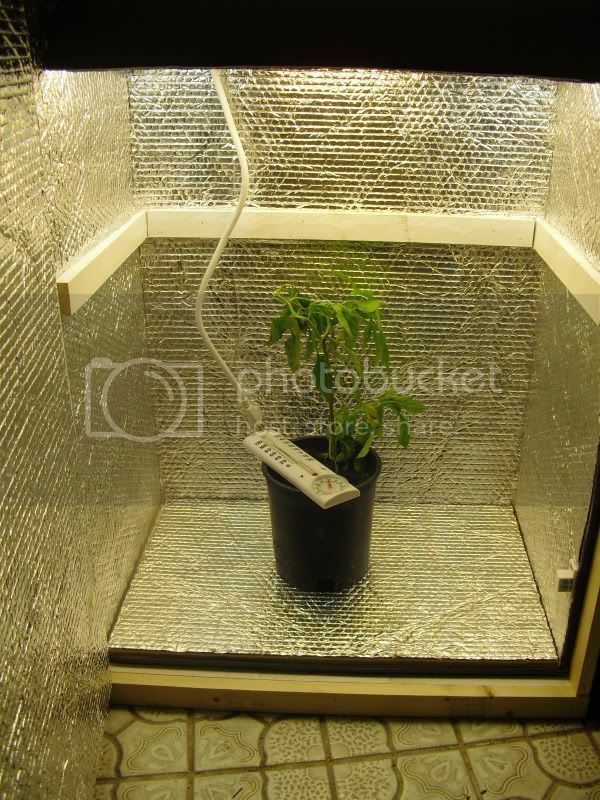 not the strongest ya need all ya got) that is not going to full use to grow, you're just lighting your room. Edited by IndyHot, 23 October 2011 - 06:50 PM. will be watching this thread intently, as I will be ghetto-rigging some type of CFL + scrapwood + other materials growbox. Sorry WGB but it;s cool. Salsa Lady I put ya in his place, seed, or grow your own. Seed has now been mailed out to all in this. Happy growing. As a side note while I am supplying the seed it is from a plant I just bought and not one I have grown before so no experience with it. Sounds like a good challenge, but 30 days only? I think you guys should do a 60 or 90 day challenge to see who can REALLY grow like a pro! Exactly, I was thinking let it ride the entire winter out till spring set out. Choose a date that best suits that for lots of growers...something like April 20th...or so...and on that set out day we all post pictures from under the glorious sunlight to see who's got the goods. I mean, 60 days should be enough to see who's got their "i's dotted" at that stage. Rapid early growth is not hard to achieve, ya just gotta know what young tender roots want. Either way I look forward to seeing what folks come up with. Flouro's FTW! Edited by Pepper-Guru, 26 October 2011 - 01:34 PM. Glad to hear seed is out, if everyone gets them we could start this sunday if ya'll want. We can keep it going longer if people are interested. I only thought 60 days, so people following will have a lil heads up on how to start under light for plant out. I live in Orlando, so I don't need to do a full grow under lights, only 6 weeks of winter here. Everyone else in, post up a pic of your set up. I have finished my other box, try and get pics tonight. It has always been a 60 day challenge not a 30. 60 days out from Nov. 6th gets us to our seed starting season for the slower to mature types of peppers. So when Jan 6th comes around I will be moving them out of the grow box to make room for my coming season of peppers. I am not supposed to give to much away with the type of pepper seed sent but it is a short season or quick to mature type with 56 days to pepper up listed (from transplant). This should give any of us a good shot of having pods on our plants after 60 days even if they are not ripe yet. Edited by onefowl1, 26 October 2011 - 03:23 PM.